Drs. 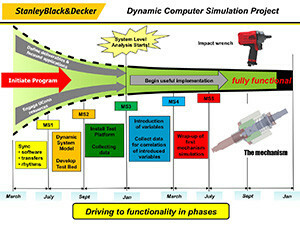 Jiong Tang and Chengyu Cao are collaborating with engineers at global tool giant Stanley Black & Decker to create a methodology to analyze the precise mechanism of tools in two of the company’s product lines, impact wrenches and air hammers, as the key step in developing software capable of shortening the company’s new product development cycle and enhancing the product performance. Their Stanley Black & Decker collaborator on the project is Mark Lehnert, Vice President of Product Development. Impact wrenches are widely used in infrastructure construction, manufacturing assembly, machine repair and other industrial applications requiring a high torque output. According to Tang, a professor of Mechanical Engineering, the basic mechanism was invented over 80 years ago and exploits the impact momentum produced when an internal hammer is rotated by a motor at an accelerating rate before striking an anvil. The force of the strike results in an impact causing high torque that far exceeds what could be produced solely by the motor, and after striking the anvil, the hammer is quickly retracted and again spun by the motor. In response, the bolt or screw tightens. The UConn/Stanley Black & Decker team has planned a multi-phase project, with the first step centering on the careful mechanical analysis of the wrench aimed at revealing the precise action underway when the wrench is operating. “Jiong and Chengyu are doing a very ‘deep dive’ analysis that will allow us to understand at a fundamental level the mechanics of the impact wrench. This will lead to the development of better simulation models and allow us to introduce variables such as different materials, heat treating variations and the like,” says Lehnert. One challenge involves the gear transmission in impact wrenches. Tang explains that, while gear transmissions are employed in a myriad of machines and are seemingly an ‘old’ subject, researchers do not yet have a complete understanding of these devices, due to the nonlinear gear meshing and time-periodicity, which generate very complex vibratory behaviors that often cause unexpected failures. Tang remarks that these issues are not uncommon in much larger-scale devices such as wind turbines, which are another application area within his research scope. In the case of impact wrench, the problem is further compounded by the consecutive impacts that create additional vibrations. If the vibrations are well understood and then mitigated by new designs, the precision and durability can be enhanced. To work toward a better understanding of the tool mechanisms, Tang, Cao and their graduate students, Victor Zhang and David Yoo, are developing a dynamic model using a series of software platforms. They combine first-principle based global modeling with local finite element analysis to predict the time-domain response of the impact wrench, and further incorporate advanced frequency-domain-based algorithms to assist in parametric analysis. This month the two-year project, which began in July 2013, is approaching an important milestone. As the UConn researchers are putting together a system-level dynamic model, Stanley Black & Decker is developing a test bed that will enable the researchers to collect data from a prototype. When complete, this process will be repeated, step for step, for the air hammer. Air, or pneumatic, hammers exploit a compressed air and piston system to produce a rapid-fire movement of a piston much like that of a woodpecker drilling for insects on a tree. Air hammers are commonly used to hammer nails, cut metal, engrave ornamental designs onto materials or drill holes. 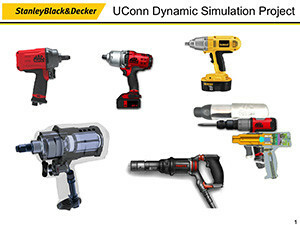 For Stanley Black & Decker, this industry-university collaboration promises to enable the company to develop more customized, durable tools on a dramatically reduced time-to-market cycle. As the nation redoubles its support for a revival in American manufacturing, academic-industry partnerships are likely to gain increasing momentum.